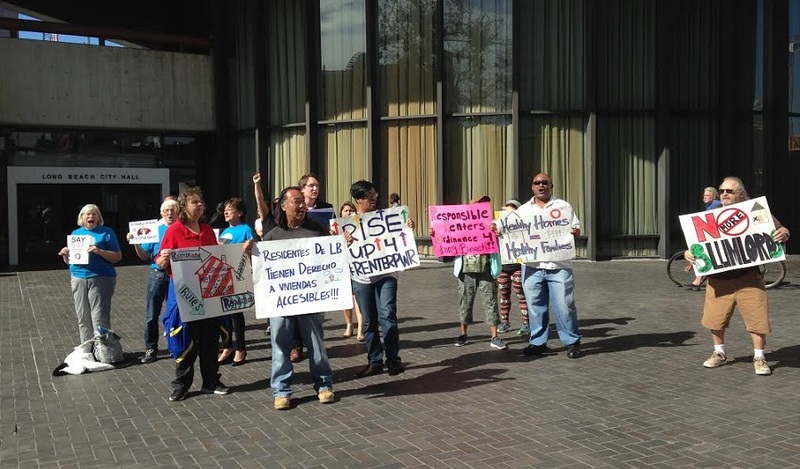 Rent control advocates protest outside City Hall in Long Beach. File photo. This is how Professor Manuel Pastor begins his discussion on rent control. Historically speaking, economists on both the right and the left have been against minimum wage increases and rent control; however, the clear difference between the two is that, as of the past 15 or so years, economists generally agree that wage increases have little impact on overall employment but rent control remains firmly in the “bad idea” camp. Pastor’s research, with graduates Vanessa Carter and Maya Abood, takes on the task of questioning the literature against rent control and analyzing if moderate forms of rent control would actually help with the housing crisis, as growing research begins to show that rent stabilization could indeed help. Within Long Beach, the hopes to have a local initiative ultimately failed (and even worse, speculation that the recent flurry of rent increases were prompted by property owners having to contend with rent control, flooding their bank accounts with extra cash despite the initiative never making it to the ballot). However, given Prop. 10—the ballot initiative facing voters this November which would overturn the Costa-Hawkins Rental Housing Act, a 1995 law that prevents rent control being placed on any units built after that year—the discussion around rent control is becoming heated. Pastor brings up the many arguments—that at one time, I myself mistakenly argued with—brought up by the anti-rent control lobby: Property owners will stop maintaining their properties, owner move-in evictions will increase, conversion to condos will go up and long-term affordability will be avoided. However, much of the evidence provided has been either skewed or ignoring social issues like stability within neighborhoods. For example, multiple studies in New Jersey, the most rent-regulated state in the country, have shown that rent control has had little impact on rent levels and availability, contrary to common economic research. But this was because, according to Pastor and his crew, researchers accounted for income levels, the racial makeup of neighborhoods and other related factors. While his research does help answer some questions—examples include “Do rent regulations increase the cost of renting non-regulated units?” and “Do rent regulations decrease the property values of apartment buildings for owners?”—Pastor noted that his research is not perfect. Multiple questions surrounding the implementation of rent control convolute the matter: If only a particular group gains from rent control—those who already have roofs over their heads that they can afford—how are we to improve the lives of other, less fortunate residents? What are the impacts on small landlords, the folks that value the stability of their tenants—these landlords rarely raise rent significantly—but lose from lower potential profits should rent control be implemented? In other words, his research suggests that rent regulation is one of many tools to take on the housing crisis directly. In fact, he directly asserts that moderate rent stabilization measures will promote longer stability among residents while slowing displacement caused by gentrification.